We’d love your help. Let us know what’s wrong with this preview of What We See by Stephen A. Goldsmith. A timely revisitation of renowned urbanist-activist Jane Jacobs' lifework, What We See: Advancing the Observations of Jane Jacobs invites thirty pundits and practitioners across fields to refresh Jacobs' economic, social and urban planning theories for the present day. Combining personal and professional observations with meditations on Jacobs' insights, essayists bring th A timely revisitation of renowned urbanist-activist Jane Jacobs' lifework, What We See: Advancing the Observations of Jane Jacobs invites thirty pundits and practitioners across fields to refresh Jacobs' economic, social and urban planning theories for the present day. Combining personal and professional observations with meditations on Jacobs' insights, essayists bring their diverse experience to bear to sketch the blueprints for the living city. The book models itself after Jacobs' collaborative approach to city and community building, asking community members and niche specialists to share their knowledge with a broader community, to work together toward a common goal of building the 21st century city. The resulting collection of original essays expounds and expands Jacobs' ideas on the qualities of a vibrant, robust urban area. It offers the generalist, the activist, and the urban planner practical examples of the benefits of planning that encourages community participation, pedestrianism, diversity, environmental responsibility and self-sufficiency. Bob Sirman, director of the Canada Council for the Arts, describes how built form should be an embodiment of a community narrative. Daniel Kemmis, former Mayor of Missoula, shares an imagined dialog with Jacobs,' discussing the delicate interconnection between cities and their surrounding rural areas. And Roberta Brandes Gratz—urban critic, author, and former head of Public Policy of the New York State Preservation League—asserts the importance of architectural preservation to environmentally sound urban planning practices. To ask other readers questions about What We See, please sign up. This book is timely. With the approach the 50th anniversary of Death & Life of Great American Cities this October, we need, more than ever, to advance our observations. Just as in 1961, we are struggling with an upheaval of how our urban areas function. The financial crisis spawned by the largely suburban mortgage meltdown has us rethinking how and where we live. The gulf oil spill highlighting the costs of even consuming domestic oil, has people talking about our addiction to the automobile This book is timely. With the approach the 50th anniversary of Death & Life of Great American Cities this October, we need, more than ever, to advance our observations. Just as in 1961, we are struggling with an upheaval of how our urban areas function. The financial crisis spawned by the largely suburban mortgage meltdown has us rethinking how and where we live. The gulf oil spill highlighting the costs of even consuming domestic oil, has people talking about our addiction to the automobile. I am amazed at how accurately she predicted much of our current situation in her last book Dark Ages Ahead. If anyone had any doubts before the global recession that Jacobs was right about the interdependence of everything, and the need for an integrated approach, they should be answered now. At the dawn of the ‘century of the city’, we would do well to take another look at Jacobs examination of the urban environment. What We See does just that. And in doing so, it introduces a new generation of urban thinkers, who—while influenced by Jane—are developing a new generation of urban visions and strategies to cope with our new generation of urban problems. A collection of essays that reflect on the work and influence of Jane Jacobs. Like all edited collections because it encompasses such a broad topic the essays are uneven, but important for anyone interested in Jacobs' work. 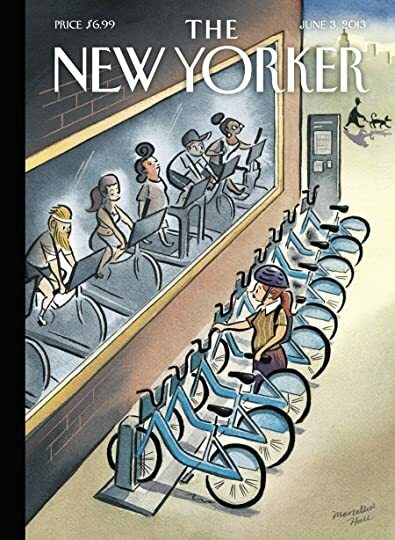 Bike shares hit New York last week, and Tbe New Yorker commemorated it with a cover that points up one of the follies of urban life. Made me wonder what Jane Jacobs, that lover of New York and walkable/bikeable cities, would think. The late urbanist, whose iconoclastic ideas turned thinking about cities on its head in the 1960s, was a friend of the bicycle: she spent hours one summer helping her son assemble bikes that he'd imported from China as part of an attempt to get people on two wheels. A Bike shares hit New York last week, and Tbe New Yorker commemorated it with a cover that points up one of the follies of urban life. As the success of bike-share programs show, her ideas are increasingly relevant. 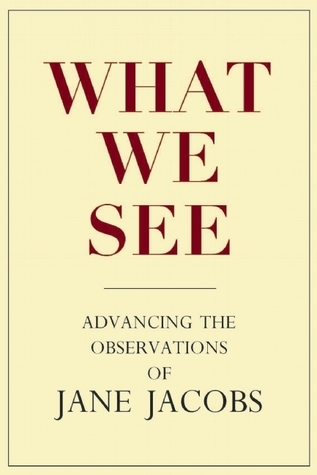 An appreciation of that comes out in the recent collection of essays on her and her legacy, called What We See: Advancing the Observations of Jane Jacobs. Edited by Stephen A. Goldsmith and Lynne Elizabeth, it contains more than 30 short reflections about what Jacobs meant in New York, Toronto and around the world, how her ideas have been influential, and how events elsewhere demonstrate her perspicacity. It ends with a series of questions about each essay that could serve as points of departure for discussion by community groups about their own particular problems, or as study guides in urban affairs programs. Let me say straight up that Jane Jacobs is one of my heroes. Her ideas about cities inspired my book Green City: People, Nature and Urban Places, and she is a character in my The Walkable City: From Haussmann’s Boulevards to Jane Jacobs’ Street and Beyond. When What We See... came out, I spent several evenings dipping into it with pleasure. And by chance at the same time I was also reading James Holston’s The Modernist City, an anthropological study of Brasília which in many respects is the antithesis of what Jacobs’ stood for. The two books go together like hand in glove, although there is no mention of Jacobs in Holston’s work. The Brazilian capitol which celebrated its 50th anniversary in April, 2010, was conceived as an egalitarian model city inspired by the Swiss architect Le Corbusier exactly at the moment that Jacobs was noting the problems the modernist idea was presenting elsewhere. Brasília features big blocks of residences, grand vistas of public buildings, wide highways for automobiles and no streets. From the beginning, however, the people who built it and the people who wanted to live there tried to undo the modernist vision. One example which Jacobs would have appreciated is the way storekeepers given space in large buildings where the entrances were to be on verdant parkland, switched their shops’ orientation. The opposite side, facing on the walkways and parking lots intended for provisioning the stores, became the “fronts” because people wanted the bustle of a street-like setting. It’s interesting that one of the contributors to What We See is Jaime Lerner, the former mayor of another Brazilian city, Curitiba. Beginning in the 1970s, the main commercial streets there became pedestrian, and an integrated public transportation system has developed to become a model of how to woo people away from private car and to stop urban sprawl of both the middle class and the slum variety. Perhaps because I live in a Canadian city and because I’ve followed Jacobs’ thought for more than 40 years, I found contributions from writers outside North America the most interesting and original parts of What We See. For example, Matias Echanove and Rahul Srivastava’s essay “The Village Inside” told me much I didn’t know about how Tokyo grew by incorporating villages into the urban fabric. The result was a rich—if sometimes “messy” looking—mix of residential, commercial and industrial uses. Dharavi, the Mumbai slum featured in Slumdog Millionaire, has several points in common with the Tokyo of the early 20th century, the authors suggest. I bet London of the 19th century did too. The lessons to draw from these examples underscore the importance of working on a human scale to integrate different elements in a growing city, and not to raze what’s there or try to build a city on a virgin site as was done in Brasília. As for biking in Brasilia, it wouldn't seem that people do much of it. Check out this video made last November of a group, Pedal Noturno, of night bike riders crossing a bridge in the city. http://www.youtube.com/watch?v=vJE1rl... The fact that there are so few riders suggests that biking doesn't have the cachet it has elsewhere--or that it's anything but something to do on special occasions. This book may of limited use to anyone who hasn't read Jane Jacob's Death and Life of Great American Cities. To anyone who has, it's interesting in two dimensions: for the substantive responses to Jacob's ideas offered by various contributors; and as an artifact, a mark of how the ideas of a truly insightful, idiosyncratic thinker can be absorbed, misunderstood, tamed, or simply ignored in the next one or two generations. The place to start this collection is with the epilogue, Mary Rowe, 'Jane' This book may of limited use to anyone who hasn't read Jane Jacob's Death and Life of Great American Cities. To anyone who has, it's interesting in two dimensions: for the substantive responses to Jacob's ideas offered by various contributors; and as an artifact, a mark of how the ideas of a truly insightful, idiosyncratic thinker can be absorbed, misunderstood, tamed, or simply ignored in the next one or two generations. The place to start this collection is with the epilogue, Mary Rowe, 'Jane's Cup of Tea', which describes Jacob's intellectual personality - pragmatic, playful, inductive, and sharply critical of fuzzy thinking while also being personally generous: "She was a fierce intellect, but not a predictable one. One of the infuriating ways in which some of those who valued her work have coped with her death...has been to invoke a kitschy adaptation from the evangelical movement, and propose it as a useful question: What Would Jane Say? Well, one of the most salient attributes of Jane Jacobs is that you never had a clue what Jane might say, or how she might say it." (311). This piece is probably one of the few in the book worth reading before picking up Death and Life, or any of Jacobs' other works. Not surprisingly, the essays in this collection are uneven; they also engage with Jacobs' thought in wildly disparate ways. Some essentially don't; the authors draw some commonplace observation from Jacobs - that cities have emergent properties (Sanford Ikeda, 'The Mirage of the Efficient City') or are not efficient in conventional neoclassical economic terms (Nabeel Hamdi, 'The Intelligence of Informality'), but it's clear that these authors are keying less off Jacobs than other recent writer and thinkers. Ray Suarez, 'Jane Jacobs and the Battle for the Street', essentially reiterates a couple themes from Death and Life with less verve. Other authors play off of Jacobs' themes with lyric descriptions of streets or archictural design or processes of community involvement. The sixth section of the book consists of economic essays responding to Jacobs' favorite work, her lesser-known The Economy of Cities. These four essays are distinctly alternative in tone; Pierre Desrochers and Samuel Leppala, 'Rethinking Jacobs Spillovers', discuss her inadequate reception among more mainstream economists, but it would have been nice to read a more critical evaluation by a mainstream urban economist. This book is a collection of essays based loosely on the work of Jane Jacobs (most known for her book The Death and Life of Great American Cities, although she wrote numerous other books). Many of the essays are quite unimpressive, stringing together clichés or telling me what I already knew. *Ray Suarez's overview of suburban sprawl. Suarez points out that parents often move to suburbia for the benefit of children, but in some ways this experiment This book is a collection of essays based loosely on the work of Jane Jacobs (most known for her book The Death and Life of Great American Cities, although she wrote numerous other books). Many of the essays are quite unimpressive, stringing together clichés or telling me what I already knew. *Ray Suarez's overview of suburban sprawl. Suarez points out that parents often move to suburbia for the benefit of children, but in some ways this experiment has failed, as suburbs "required more adult oversight, not less ... scrubbing the environment of outsiders heightened stranger anxiety rather than alleviating it." *Robert Sirman's essay is one of the better examples of how Jacobs' views can be applied in unfamiliar contexts. Sirman helped expand a ballet school in Toronto; rather than turning the school inward, away from the street, Sirman sought to revitalize the street- for example by supporting a nearby restaurant's attempt to open an outdoor patio, on the grounds that it would provide "eyes on the street" and thus make it seem less deserted. *Hillary Brown's discussion of how "mixed use" can be applied to unfamiliar contexts- not just putting apartments above shops, but also adding various types of infrastructure together (for example, a Dutch bridge that accommodates not only pedestrian and vehicle traffic, but tramlines and utilities). *Clare Cooper Marcus's discussion of attempts to combine the advantages of cul-de-sacs with the advantages of grids. (This essay was, however, far too pro-cul-de-sac for my taste, downplaying the reduced walkability of cul-de-sacs by seemingly taking it for granted that children would have no place to walk to outside their own block). If you don't know who Jane Jacobs is, then first read The Death and Life of Great American Cities, which forcefully argued (in 1961!) that cities should be built for people, not for cars. That seems like common sense to me, so I am amazed that her influence is just beginning to be felt only now. This book is a series of essays by people who have been influenced by Jacobs. I especially enjoyed the hands-on accounts of planners who have implemented some of Jacobs' ideas on the ground, such as Janette If you don't know who Jane Jacobs is, then first read The Death and Life of Great American Cities, which forcefully argued (in 1961!) that cities should be built for people, not for cars. I especially enjoyed the hands-on accounts of planners who have implemented some of Jacobs' ideas on the ground, such as Janette Sadik-Khan in New York, and Jaime Lerner in Curitiba, Brazil. A few parts got too sentimental about Jane the person instead of focusing on Jane's ideas, as it is clear Jane would have preferred us to do. The best chapters for me were the ones on economics, since very little progress has been made to advance Jane's insights into how things work. Overall a good book with a variety of perspectives and a litany of subject matter. Read Jane's books first, and then follow up with this.